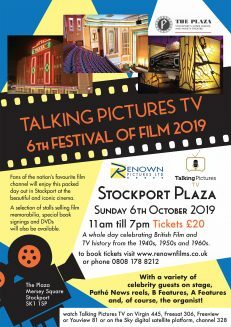 Renown Pictures and Talking Pictures TV are delighted to announce another festival of film for 2019, in The Iconic Stockport Plaza Cinema. 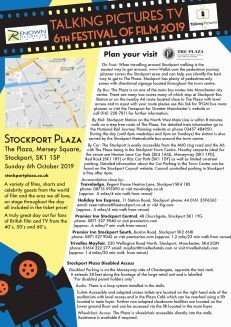 In October 1932 a vision was born for Stockport and the Northwest in the form of a Super Cinema and Variety Theatre that would evoke the glamour of the era with its sumptuous surroundings, highest possible attention to detail in its customer care and an eclectic mix of screen and stage presentation. 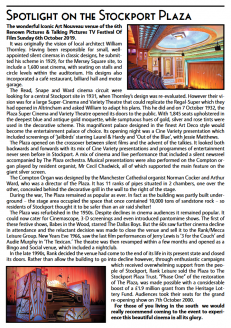 Over 85 years on and your Plaza Super Cinema and Variety Theatre stills hosts the biggest stage presentations. With A Variety Of Celebrity Guests on Stage, Pathe News Reels, B features and A features, and of course the organist! Fan’s of the nation’s favourite film channel will enjoy this packed day out in Stockport, with a selection of stalls selling memorabillia, book signings and dvds.